If you join Tabletopia via the website, you can activate your Steam account for free and play the client version. If you installed Tabletopia on Steam, you can access the browser version to use some features not available via Steam (Workshop, password change, etc.). If you have not yet connected your Steam account to Tabletopia, a notification suggesting that you do this is visible to you whenever you open Tabletopia in your browser. Click Connect in the header or go to your Profile page > Edit Profile > Social Accounts > Connect Steam. You will be redirected to the Steam website. 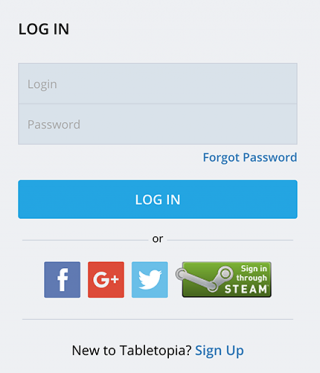 Enter your Steam username and password and click Sign in. Or create an account if you do not have one. After logging in, you will receive a confirmation about your connected Steam account on your Profile page in Tabletopia. Copy your Tabletopia code for Steam in your Profile on Tabletopia. Activate Tabletopia in the Steam client: Games > Activate a product on Steam (See Activating a Product on Steam for more details). Wait until the downloading process is finished. You are ready to go! Now you can select Tabletopia in your list of games on Steam and click Play to play Tabletopia via Steam client. If you joined Tabletopia throught Steam, you can also start using Tabletopia in your web browser. Workshop access. You can create, test, and publish your own games using our simple web interface (no programming skills required). Adding social accounts, changing password, and managing some other profile settings. Playing games in web browser. You can play games in browser without the need to install the Steam client. Forums access. You can discuss games, find opponents and ask questions on the Tabletopia forums. Run Tabletopia on Steam. Your Tabletopia account will be automatically created. Go to the Tabletopia log in page https://tabletopia.com/login in your web browser and click Sign in through Steam. You will be redirected to the Steam website. 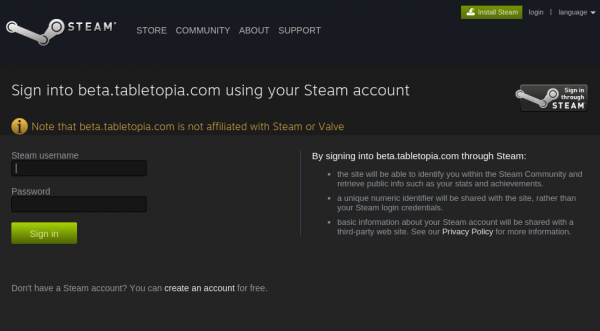 Sign in with the Steam account you use to access Tabletopia. After logging in, you will be able to access Tabletopia in your browser.